Stertil-Koni recently announced that it achieved record sales growth in 2018, capturing additional market share in both the municipal and public sectors across the U.S. and Canada. “In 2018, the Stertil-Koni inground DIAMONDLIFT became the 1st piston-style lift in North America with a continuous recess system. Why is that so significant? With Stertil-Koni, our lifting unit travels horizontally, while fully recessed below floor level, making it easier and safer to lift low-clearance vehicles,” noted company president, Dr. Jean DellAmore. In addition, Stertil-Koni introduced a broader range of adapters in 2018 for the inground scissor ECOLIFT and telescopic piston DIAMONDLIFT. These help facilitate more efficient lifting by engaging the front and rear lifting points on buses and trucks. Stertil-Koni also brought to market inground lift adapters for school buses and trucks. These securely embrace the vehicles’ axles, frame or suspension. Stertil-Koni accelerated its environmental stewardship, building on the “green” movement throughout the transportation sector. 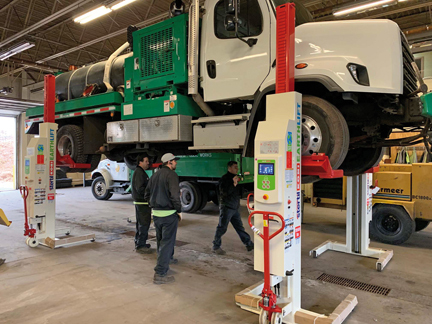 One of the top performers in 2018 was the Stertil-Koni wireless Mobile Column EARTHLIFT, made from components that are 98% recyclable and utilizing an Active Energy Retrieval System that saves power and delivers up to 35% more lifting cycles at maximum load. The company also broadened the deployment of the telescopic piston DIAMONDLIFT and scissor-style ECOLIFT which utilize a high-pressure low fluid volume design with containment systems to mitigate the possibility of hazardous fluids entering the surrounding environment.